Published Apr 18, 2017 by Addison-Wesley Professional. Part of the LiveLessons series. 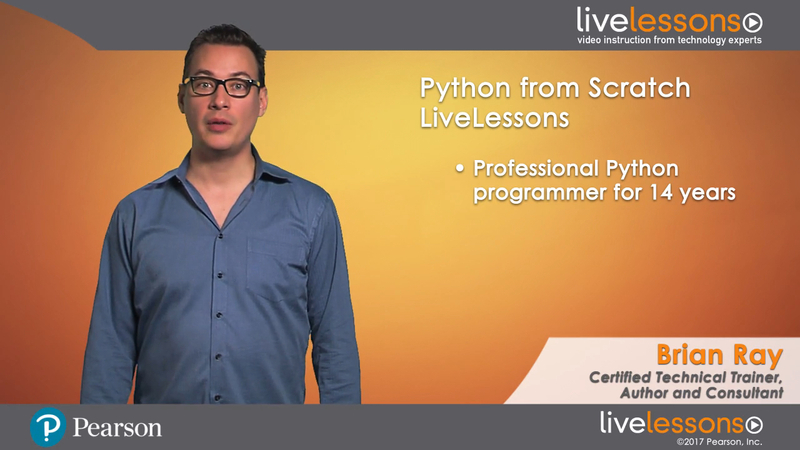 Python from Scratch LiveLessons is a gentler, more entertaining, and more practical starting point to learning the Python programming language. Unlike the typical approach to teaching a programming language that covers each feature section by section, this course is structured more like a cooking class. You can follow along and execute all the code being demonstrated in an interactive notebook as you watch the video, much the same way you would watch a cooking video in your kitchen. Beginner level for anyone new to Python and object-oriented programming. Builds from scratch from beginner to more advanced topics through a follow-along approach. Python 3 with Jupyter (http://bit.ly/PyScratchInstall) installed on your computer, along with the source files found on http://bit.ly/PyScratch. Anaconda downloads are available for Apple OS X, Microsoft Windows, and most Linux distributions. This lesson shows how to set up on the platform used throughout the course. It also demonstrates the final product--a Pie Factory that you interact with through a web browser. The backend demonstrates how to hold the logic and data that powers the factory. This lesson focuses on how to read input from an external source. In this case, it's a copy of my Grandmother's Apple pie recipe saved to disk. We break the text up into parts. We introduce the concept of functions. Finally, we refactor all the breaking up of the recipe code into functions to introduce reusability. This lesson focuses on converting the text in the recipe into some representative data types so we can work with them. For example, our program needs to know what the string "1/2 cup of flour" really means. In Lesson 2, we read the ingredients/steps. In Lesson 3, we parsed those ingredients to gain some understanding of what they do. Now we take the steps and mix the ingredients so that you come to a deeper understanding of advanced data structures, like dictionaries. This lesson goes deeper into functions in Python. You learn about the syntax, how to write, how to execute, and how to document. You learn a little bit about how to run many functions at the same time. Finally, you learn about parameters and arguments and how they can be customized in order to form more functionality to accomplish real tasks while re-using code. In this lesson, we start creating our own Pie Class. The running metaphor melds nicely with the idea of repeatability without giving up flexibility. We experience the beauty of Python as we start to dive deeper into the concepts of object-oriented programming. In this lesson, you learn how Python works as a glue language. You learn about Application Program Interfaces (APIs) and how and why to use them. Similar to Lesson 2, when we read data into our program, you now learn how we both read data in and push data out to other programs. This enables our program to talk to another program. Before we do so, we set a simulation so we can isolate functionally before we hook it all up in Lesson 8. In this final lesson, we create our complete program and talk about the technology stack. We create a simple User Interface for the browser, and we hook that up to our code. We learn about a couple of open source libraries that provide some underlying functionality to support us in the task. 3.1 What is an ingredient? What is a type?